Earn $4.00 in VIP credit (400 points)What's This? 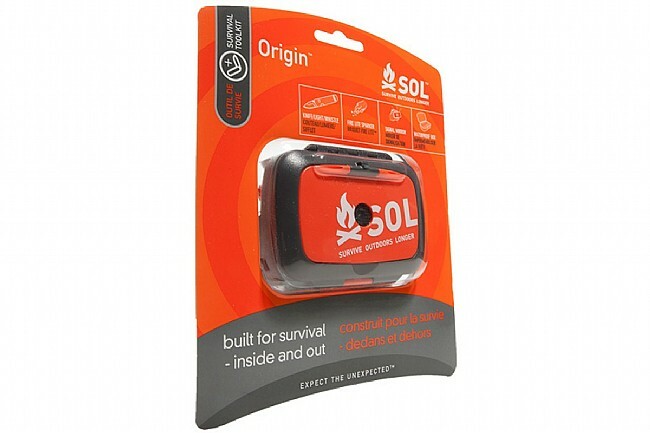 Adventure Medical Kit's SOL Origin™ redefines the survival kit from the ground up. In one lightweight palm-sized product, the Origin™ provides a collection of tools essential to surviving the unexpected. The heart of the Origin™ is its ABS-plastic waterproof case which contains an array of key survival tools including Tinder-Quik™ fire starters, 150lb-test braided nylon cord, mil-spec stainless steel wire, and an emergency sewing and fishing kit. Integrated into the Origin’s lid is a flip-up Rescue Flash™ signal mirror with a retroreflective aiming aid. Flip the case over and find the one-hand-operable Fire Lite™ sparker, a removable liquid-damped compass, and a versatile folding lock-blade knife secured in a button-release slot. This survival knife features a 100db rescue whistle, ultra-bright LED light integrated into the handle, and an AUS-8 steel drop-point blade designed for precision cutting. 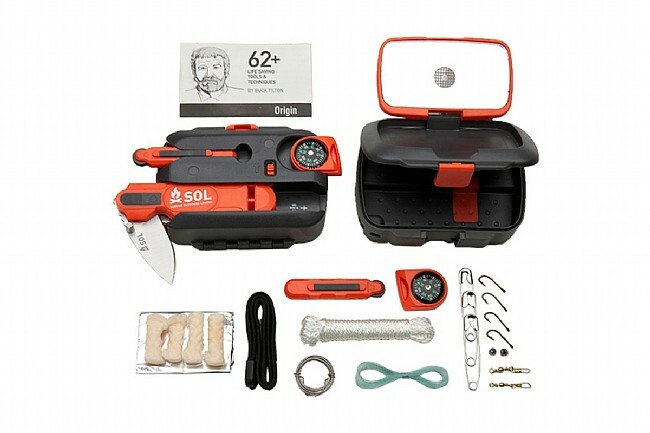 For those unfamiliar with wilderness survival, this kit conveniently comes with a guide containing over 60 survival techniques and strategies. Size: 3.875" x 2.75" x 1.5"; Weight: 6.1oz. AUS-8 stainless steel folding knife. Stainless steel safety wire, 6 ft of 0.020". Buck Tilton's 62+ Lifesaving Tools & Techniques. Heavy duty aluminum foil, 3 Sq. Ft.